Scroll down for details of more than 120 bike shops & mechanics across Portugal. Everyone on a bike tour needs a little help sometimes – even if only because they’ve ridden so far they’ve worn out their tyres! The list below includes bike shops recommended by both myself and fellow cyclists. It also includes shops/mechanics I’ve found by searching online, plus others that have asked to go on the list – so be aware these are not recommendations but purely for your information. In small towns there may not be a specific “bike shop” but local mechanics/hardware stores often carry some bike parts alongside chainsaws, agricultural equipment etc. Even if they can’t provide exactly what you want, they might be able to fix your bike up well enough to get to the next big town. I’m also always keen to add to the list. If you know a good bike shop or mechanic, please add a comment in the box at the bottom of the page, email pedalportugal@gmail.com or use Facebook. Entries below are listed the same way as other parts of the site – towns are in alphabetical order under the name of their region. As well as a online shop offering a comprehensive looking range of parts and accessories, BikeZone has a chain of 16 bricks and mortar stores on the mainland (plus one on Madeira), most but not all in the northern half of the country. Most Decathlons are in out-of-town retail parks. You’ll also find SportZone another source of cycle clothing and equipment. Their shops are often in town and in smaller shopping centres as well as some larger outlets. Portuguese cyclist João Jorge Araύjo recommends the online ProBikeshop as a source of supplies. You may also want to look at non-Portuguese online suppliers like Wiggle and Chain Reaction Cycles if you’ve got the time to have gear sent to you – particularly if you’re after something less mainstream. You may also find other bike shops on this Orbea list. Tomo Bike is an Orbea dealer on Av. 25 de Abril. Botas Bike Shop is a mountain bike shop on Rua dos Pinheiros Mansos. BARCELOS: BikeZone has a store here. BRAGA: Braga Bike – a fantastic shop according to local cyclist João Jorge Araύjo. There’s also a BikeZone store and a Decathlon. Bbike is on the N15 going north out of town – offers technical assistance and sells accessories and parts. Bike Centro is on Rua 5 de Outubro in the old part of town. Bike Morais is a Giant dealer to the south of town on Alameda de Santa Apolónia. CALDAS DAS TAIPAS: MS Bike stocks BH and Orbea bikes, also has a workshop. CAMINHA: My Bike is an Orbea dealer with a workshop that also does bike rental. CHAVES: Run & Bike – Specialized dealer with another branch over the border at Verin in Spain. Recommended by Pedal Portugal: Very helpful when I went there needing new pads for a disc brake. No charge for spending 20-30 mins fitting the pads and adjusting the brake! Don’t rely on the location shown on Google Maps though – the shop is on Rua Dom Afonso III, just around the corner from the big LeClerc supermarket. Tutti Bike is another option – an Orbea dealer on the northern side of town. FAFE: Bicicletas Martins is a local Orbea dealer. GUIMARÃES: BikeZone has a store here, as does Decathlon. GONDAMAR: Roda Bike is in this town to the east of Porto. LOUSADA: My Bike is a bike and outdoor equipment shop. MAIA: Ribeiro’s Bike Shop has one branch in Maia and one in Porto. There’s also a Decathlon in Maia. MARCO DE CANAVESES: Giga Bike sells bikes, clothes and parts, as well as having a workshop. MATOSINHOS: See Porto below. Also another Decathlon here. PAÇOS DE FERREIRA: Another BikeZone shop here. PESO DA REGUA: Douro Cycles is close to the centre of town. Also does bike rental through the Go Cycling Portugal network. PORTO: Various options – see also Espinho, Gondomar, Maia, Matosinhos and Vila Nova de Gaia. Ribeiro’s Bike Shop (also with a branch in Maia) is on the north-west side of the city centre. Vieguini – is the oldest bike shop in town but does not do repairs. It’s in the centre of the city, only a stone’s throw from the Douro and historic waterside area. Also does bike hire. Suggested by Francisco Melo. There’s also another BikeZone and a Decathlon. POVOA DE VARZIM: There’s a BikeZone store here. VILA NOVA DE GAIA: Options include Orbea dealer Fasa Bikes, plus a BikeZone and a Decathlon. VILA REAL: There’s a Decathlon here. VILA VERDE: Benjamim Bike Shop is an Orbea dealer in this small town north of Braga. AGUEDA: Orbita – is another shop recommended by Portuguese cyclist João Jorge Araύjo. ALBERGARIA-A-VELHA: There are three shops in town. RC Bike on the N16-2 coming into town from the south, Brinco Bike on Rua Prof. Egas Moniz and Bike Vendas going out of town on the N16-2 to the east. AVEIRO: There are a number of bike shops in the the town centre, including BiUrban, Pernalonga, Ride My Bike and Subway Bikes – plus a BikeZone shop and a Decathlon. COIMBRA: Lider Bike – The shop’s website no longer seems to be working but – if it’s still open – it’s at Av. Elísio de Moura 373. Francisco and other staff speak English. Stocks a large range of parts and very helpful. Highly recommended by Andy Smallwood. CycleSpace is an Orbea dealer on the NE side of the city. And there’s a BikeZone outlet and a Decathlon in Taveiro, out to the west of Coimbra. CASTELO BRANCO: AmieiroBikes is on the eastern side of town and sells clothes, parts etc. There’s also a Decathlon on the southern edge of town. FEIRA: Bicineves is an Orbea dealer in this small town north of Aveiro. FUNDÃO: Catebike is a local Orbea dealer that also sells accessories and has a workshop. GarBike – is a Specialized dealer in São Miguel de Guarda, a suburb on the north side of the town (to NW of station). Pirry Sport Bike – no idea what the shop’s like but Facebook page has address details and opening hours. ILHAVO: Pabol is an Orbea dealer and bike accessory shop out on the coast in Gafanha do Carmo to the west of Ilhavo – also sells some used/second-hand items. VALE DE CAMBRA: RP Bike Shop is on the N328 near the municipal market in the centre of town. VISEU: Bicitec is an Orbea dealer that also has a workshop. In Abraveses on north side of town. There’s also a Decathlon here and a BikeZone. ALCOBAÇA: Has a Decathlon Express store. BATALHA: Leiribike is a dealer for several major bike brands, as well as selling clothing. It also has its own workshop and is on an industrial site just off the N1 north of Batalha. BENEDITA: Benebike is a cycling “mega store” in a small village on the N1 to the north of Rio Maior. CALDAS DA RAINHA: There’s a BikeZone shop here. CASCAIS: Avalanche is on the western side of Cascais, just off the main N247 – strategically positioned by the start of the Cascais-Guincho cycleway! Offers a repair service as well as bikes, spares and clothing. There’s also a Decathlon store out to the north. 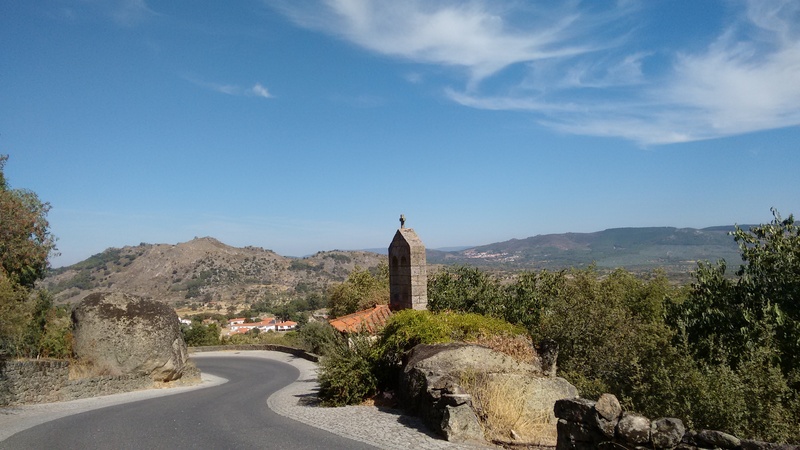 FIGUEIRO DOS VINHOS: Jackie Green recommends Evaristo Alves Dias in this small town north of Tomar – not a specialist bike shop but nice people who speak English and serviced her bike! LEIRIA: There’s another BikeZone here and a Decathlon. LISBON: See also Cascais and Sintra entries. Cenas A Pedal – for touring bikes and accessories, and a good mechanic, check us out in Lisboa (shop’s own info). Also highly recommended by João Jorge Araύjo, who rates them as “undoubtedly one of the best stores you can find in Portugal”. Loja Das Bicicletas – which translates as ‘bicycle shop’! – is highly recommended by Barrie Pearce, who says “great mechanics, I always use this shop”. In the Benfica area, near the Colombo shopping centre. Kombina – is very close to the main Lisboa Oriente train station (and only a couple of km) from the airport so could be very useful for arriving/departing cyclists – particularly as they will take care of shipment and assembly of bikes, as well as offering servicing and repairs. Recommended by David Wright, who was swiftly got back on the road by Kombina after a minor accident left him with a broken rear mech. Lisbon Bike Shop is in Benfica, out beyond the football stadium and hospital. Also does bike rental through the Go Cycling Portugal network. Salva Biclas is also in Benfica and has a workshop. There’s also a BikeZone and a Decathlon. ODIVELAS: Just north of Lisbon, there’s another BikeZone here. SANTAREM: Ofimoto is a bike shop on the N3 just north of town – ignore the map on the shop’s own Facebook page! There’s also a Decathlon store. SÃO JOÃO DAS LAMPAS: The BIKE Shop is described as an outdoor and sporting goods shop – also stocks Polish bike brand Zumbi. SETUBAL: Another Decathlon here and a BikeZone. See also Vila Nogueira below. SINTRA: Funbike is a Trek dealer with one shop here and another at Boliqueime in the Algarve. Also does bike hire. There’s also a Decathlon nearby. TORRES VEDRAS: Move Free is a Scott and Trek dealer on a street just off the main park. VILA NOGUEIRA DE AZEITÃO: N10 Bike is just off the road of the same name in the centre of Azeitão, to the north of Setubal. Dealer for a number of major brands. BEJA: Beja Bike Store is very conviently placed – just to the south of the historic centre. Has a workshop plus cycle clothing, parts and some used bikes. There’s also a SportZone a bit further out of town. 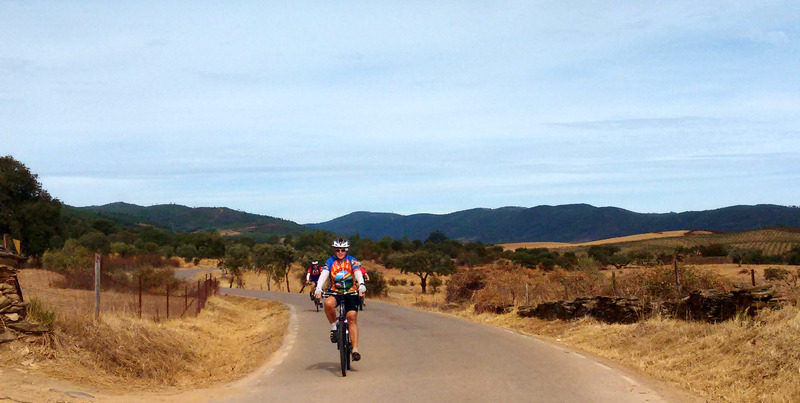 CASTRO VERDE: BikeZone – in the centre of town opposite the Hotel Vila Verde. Canadian rider Jane Hammingh described them as “extremely helpful“. ELVAS: HobbyZone Bikes – in Rua de Portalegre to the SW of the old town, off the main N4. Ciclofreca – on the southern side of town on Rua Dr António José Almeida, on the corner next to the roundabout (with the bicycle sculptures!) at the junction of the N18 and the IP2. Sells and repairs bikes. Not much English spoken but helpful and cheap. Recommended by Mark Grimes – March 2017. D’Bike is just to the south-west of the old town, close to the hospital. Also does bike rental through the Go Cycling Portugal network. Has some second-hand bikes and parts. 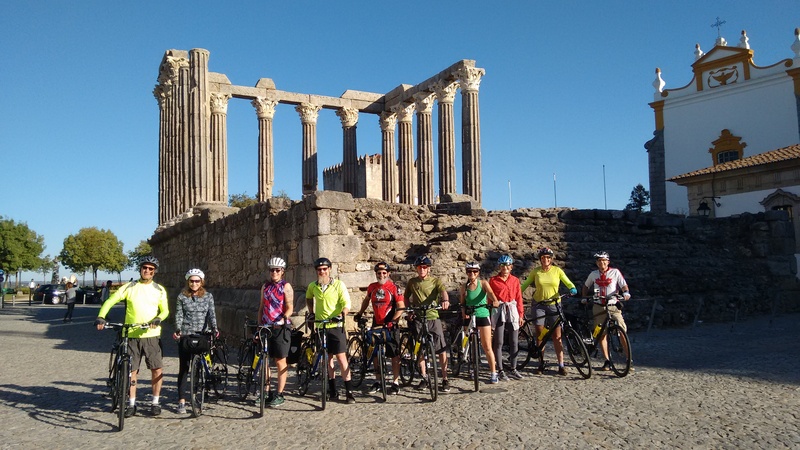 Recommended by Pedal Portugal, also by touring cyclists Matt & Debby Goodman, who said mechanic Daniel was “extremely supportive as well as knowledgeable”, doing an excellent job of setting their bikes up for a tour of the Alentejo. Galacio Bike – on Rua do Escoral, a side road on the eastern side of town. Recommended by Rob Watkins who had his pedals fixed here! There’s also a Decathlon just out of town. GRANDOLA: Bicicletas Liberato is quite central. ODEMIRA: Litoral Byke – a combined cycle and computer store in Boavista dos Pinheiros, a village out to the SW of town. It’s a small place but helpful and with a workshop. Owner Armindo Benedito speaks good English and also offers a bike pickup and repair service in case you break down anywhere within a 50km radius. Recommended by Pedal Portugal. PORTALEGRE: MP1 Bikes – Specialized dealer located on industrial estate to south of town. Recommended by Pedal Portugal – good workshop and helpful, English-speaking owner. PORTO ALTO: See Samora Correira below. REGUENGOS DE MONSARAZ: Bicifiasco – small shop in what looks at first glance like a private house on the south side of the N256 as it comes into town from Évora (close to the Galp petrol station). SAMORA CORREIRA: Ribapedal is on the N118 near the centre of this small town – also shows on some maps as Porto Alto. SETUBAL: There’s also a BikeZone here and a Decathlon. SINES: Plano B is close to the old centre of town. RP Bike – unfortunately appears to have closed down. VILA NOVA DE SANTO ANDRE: Banza & Coelho is a motorbike and bike shop in this small town on the coast north of Sines. FARO: G-Ride Bike – Also has a shop in Portimão. All the staff speak English. Stocks a large range of parts and will endeavour to help you out in any way they can. Recommended by Andy Smallwood. Decathlon has a store just off the N125 on the west of the city going out towards the airport. Not huge but has some spares and limited workshop facilities. The nearby Forum Algarve shopping centre has a SportZone, which again has a workshop, and a Jumbo supermarket that stocks some cycle spares like tubes, tyres (including some not stocked by Decathlon) and puncture repair kits. GUIA: Bike Sul is a KTM dealer with a workshop, plus spares and rental bikes. Just off the N125. Also with a shop in Messines. LAGOS: Xtreme Lagos – tucked away in a modern building just outside the old city walls on a hill above the old town. Specialized and Scott dealer. Very friendly (and English speaking) with plenty of cycling gear, plus a well-equipped workshop at the back. Only open weekdays. Recommended by Pedal Portugal and Michiel van Dam. Manuel Das Bicicletas – right in the centre of town, on Rua Dr. António J. Almeida 10/12, close to Gil Eanes square. This traditional bike shop (also does repairs and hire) has been in Lagos for more than 50 years. Michiel van Dam says: “Not a fancy place, old fashioned. Manuel knows his business- recommended.” Open Monday to Saturday. NEAR LAGOS: Ben, who lives in Barão de São João, north-west of Lagos, describes himself as a fully qualified CyTech level 3 mechanic with a fully-equipped Park Tool workshop, plus a stock of bits, and a welder living down the road. 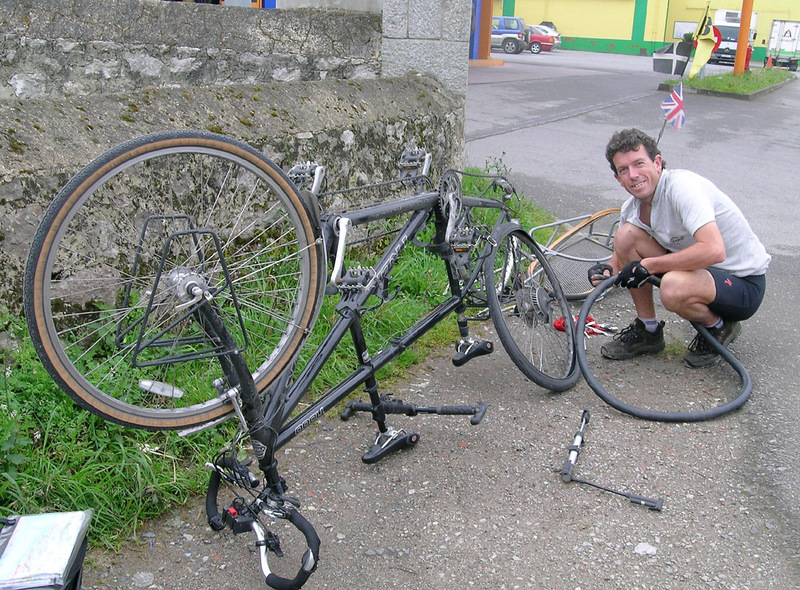 He says he is always happy to help any passing touring cyclists – or can come to you if required for emergency repairs. He is not a business and would help out on an exchange/donation basis. LOULÉ: There are several options here and in the surrounding area. Duas Rodas – close to the centre of town, due south of the bus station, on Rua Primero de Dezembro. Sells Basque brand Orbea. Freebike – is a Specialized dealer a bit further out, south-east from the town centre. 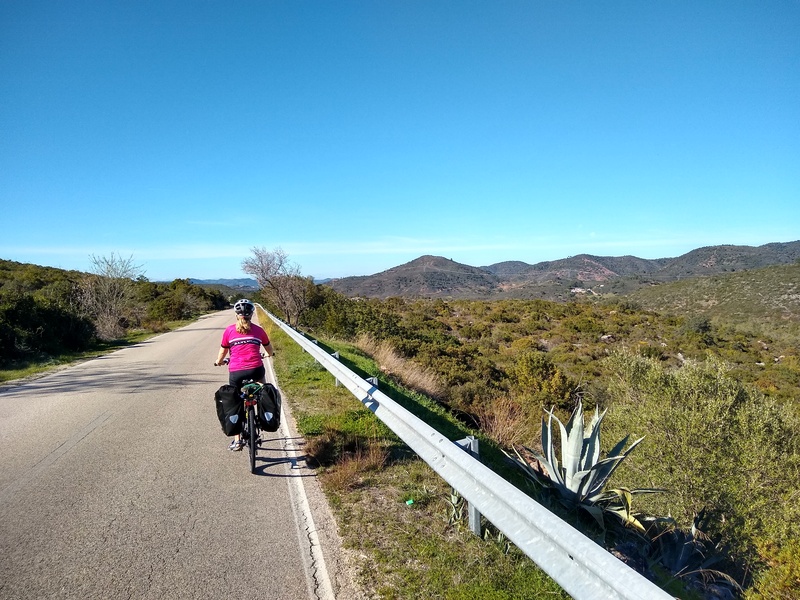 In the area around Quatro Estradas/Pereiras, which is just off the N125 and about 8km roughly SW of town (closer to Loulé’s railway station) there are two more bike shops: S-Bikes and Bikeland. Due south of town, in Almancil, there is Martin’s E-bike (which also sells ordinary bikes). All of these latter three also do cycle rental. MESSINES: Bike Sul is a KTM dealer with a workshop, plus spares and rental bikes. Just on the western side of the town centre. OLHÃO: There are a couple of options here – thanks to John Shepherd for the information. Like A Pro (formerly known as NV Bikes) has a large branch on the N125, which is the main road through town. Their workshop seems to be fully equipped, and pretty well state of the art if the stock of bikes is anything to go by, according to John Shepherd. Lots of accessories and spares. At least some of the staff speak English. There’s also a traditional Portuguese bike shop at Avenida da República 90/92 (next to Café Ice), where they speak no English but definitely seem to know their stuff. The shop has no signs outside, just two doors open when its open. Closed Saturday afternoons. Some very cheap new bikes for sale, and some secondhand ones hanging up inside. PORTIMÃO: G-Ride Bike – Also has a shop in Faro. Recommended as “first rate and very helpful” by George Smith – who lives in Portugal and uses them all the time. 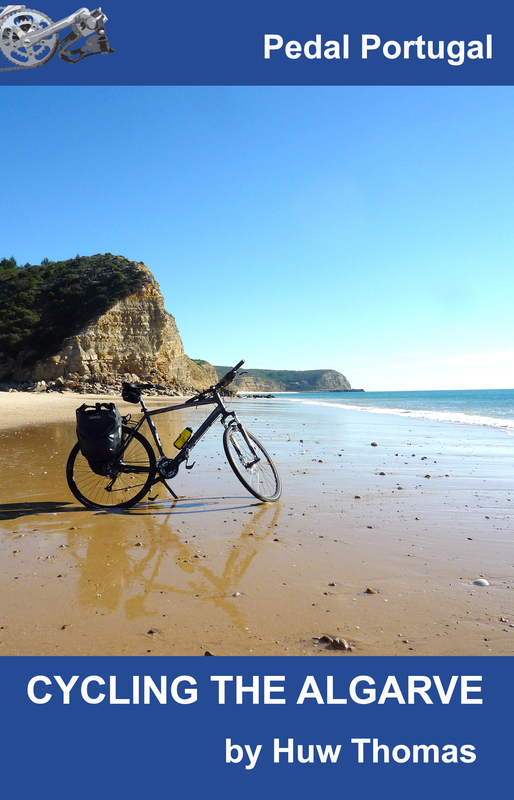 Also highly recommended by Pedal Portugal: friendly, very well-stocked and English-speaking. Helped me out twice on a recent guided tour when riders had problems with bikes they’d brought with them. OneBike – closer to the town centre, this Cube, Orbea & Trek dealer is on a side road (Rua Cidade de Darnão) that runs parallel to the main road south of the Portimão Retail Center and the Aqua Centro Commercial. Also rents bikes and has a workshop. Recommended by Michiel van Dam and Kathy Thomas. There’s also a Decathlon on the north-west edge of town. SAGRES: Sagres Bicycle & Company – new shop on the main road into town. Mechanic/owner Bruno Silva covers from Sagres to Lagos and up the coast to Aljezur – for a breakdown service contact 00351 918 471 545 or sagresbicycleandcompany@gmail.com Some excellent reviews online. SÃO BARTOLOMEU DE MESSINES: See Messines above. TAVIRA: Abilio Bikes sells Trek and Orbea bikes, plus has good in-store mechanics. Also does bike hire. Recommended by Michiel van Dam. Thanks, Nuno. I’ve added your shop to the page. Thank you for sharing this blog. This blog is very helpful. Great!! In Portimão my favourite bikeshop is G-Ride. And for many other cyclists in Western Algarve too. However there’s another professional bikeshop, One Bike, dealer of Cube, Orbea and Trek. 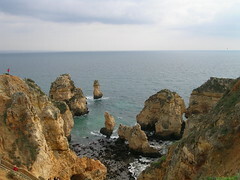 Not as far out of town, south of the Portimão Retail Center and the Aqua Centro Commercial. The GNR (police) is One Bike’s neighbour. Open Monday through Saturday 10-13 and 15-20 hours. Address: Lote 3 R/C Dto, Rua Cidade de Darnão. Also recommended.. Thanks for the update – now added to the listings. Vieguini in Porto does not do repairs, it’s mainly bike hire. Bicicletas Coelho is the place to go in Porto, a big shop with a workshop, fitted my new pedal crank in 10minutes and charged €5 for labour. Also spoke excellent English. Hi we are currently staying at camping alentejo near Estremoz and I neede a cycle shop for a tube and other bits and pieces and came across a shop in Estremoz centre. After stumbling across your page the previous day you came to mind after my visit to the shop and thought it would be a great addition to your parts and service section. The name of the shop is Biciaventura ( http://www.Biciaventura.pt ). Tel 268323404 / 967334781. Largo General Graca N80 degree- Estremoz. Two great guys with good knowledge and very professional in all aspects. A truly pleasurable experience and at a very reasonable price. Thanks very much for getting in touch. The shop is already listed in the Alentejo section under Estremoz – but I’ll add your recommendation! On this sites recommendation,took my bike for a service and new brakes to Litoral Byke in Odemira. Very efficient service from Armindo and his mechanic. Helpful and welcoming. I also had a great experience with the Litoral Byke in Odemira. Very efficient replacement of my rear derailleur and happy to meet me. Thanks for recommending them. 130 euros for a six-week period sounds a pretty good deal. On the other hand, if you just want to pick up a cheap bike I think a look around the supermarkets would still be a possibility. I think most of the bigger places often have bikes for sale. Otherwise the Decathlon in Faro would be my other thought. Their bikes are generally pretty decent for the price. Other option might be to see if you can find some ex-pat forum on Facebook. You might also be able to sell any bike on when you’ve finished with it. and LifeBikes Algarve in Alcantarilha and we does all kind of bikes! Hi Luis. Do you have a website or other contact information? Thanks – I had them on the bike hire page but not bike shops. Now on both!